TAS Recommended! Rated a 'Best Audiophile Label Recording' in The Absolute Sound! Rare originals of this recording have been going on Ebay for upwards of $1,500. The sound quality and performance are absolutely to-die-for. Today, it is difficult to understand that despite the tremendous Bach renaissance that took place in the 19th century, many compositions by the Cantor of St. Thomas’ Church in Leipzig had been underrated. The Cello Suites, for example, have been regarded for almost 300 years as purely a set of tricky etudes that every virtuoso in the making simply must tackle. Janos Starker’s recording of the Suites from 1965 makes a lasting impression on the listener, and even record producers who are well used to recorded excellence have been highly impressed. Starker’s full-bodied sound and technical brilliance are complemented by his finely chiseled interpretation that lends immense expression to Bach’s thrilling harmony and verve to the strict rhythmic construction of the movements. In terms of price and collectability the Starker discs are in a different league. The originals were made iby the celebrated Mercury Living Presence label, which some rank alongside Decca for quality of sound. Collectors usually go for the 3-LP boxed set (SR3-9016), a choice of the standard maroon or gold promotional labels (which fetch between £500 and £2,000 at auction) and are – needless to say – rare. The set was re-issued on the Mercury Golden Imports label and then remastered by Philips (who owned Mercury) and compressed onto two discs. These, and especially the latter, are – according to received opinion – of inferior sound quality, so enter Speakers Corner, re-pressing its 2004 transfer. The First Suite’s 'Praeludium' emerges from the loudspeakers with startling presence and realism, and there is a sense of reverberant acoustic and space around the sound, which makes any SACD crude by comparison. Each register is controlled, with no spurious bass echo and an exceptionally full treble, which allows one to appreciate Starker’s masterly control of variable vibrato and almost complete absence of finger noise. 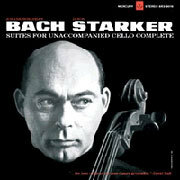 The Second and Fifth Suites were recorded earlier, and the cello sound is far larger and very different – most of this is down to Starker having changed cellos in 1965, from the huge 'Lord Aylesford' Stradivarius to a more conventionally sized Goffriller instrument – and there is less reverberation. By any standards this is marvellous sound. After listening to the Suites in one sitting, I can only say that by the cellist’s own standards these sound like live performances, without any shortcomings. The technical mastery is absolute (the Fourth Suite was recorded in one take), there is sweep, power and a frightening intensity of expression that is exhilarating and ultimately profoundly moving. but this Speakers Corner/Mercury set is one of the few that deserves, and stands, comparison with Pablo Casals. Yes you can buy them on CD for considerably less, but the sound on these LPs is immeasurably superior.